Now Jesus had risen from the dead and they still did not understand, but they believed. Faith is believing in something we don’t understand; believing in something we can’t prove. At the same time our faith is certain, “It is more certain than all human knowledge because it is founded on the very word of God who cannot lie.” CCC 156. Faith is a gift from God, but it demands a response from us. That response is to believe in divine revelation and to live what we believe. Faith is a gift, but believing is a choice; it is an act of our free will. What we celebrate today, the resurrection of Jesus Christ, is the recalling of a moment in history that changed the human experience for ever. This moment was in the mind of God from all time; prophesied by the prophets, and witnessed to by the apostles who encountered Christ on several occasions after he had risen from the dead. Because of the passion, death and resurrection of Jesus Christ we now have hope in eternal life and we need not be weighed down by the difficulties of this present life as if this is all there is. As St. Paul tells us in the second reading, “Think of what is above, not of what is on earth.” Of course there are things on earth we must think about, but we should first think of what is above and in our prayer ask God to help us with the rest. We cannot live a life of faith unless every day, throughout the day we think of what is above by way of prayer, reflection and contemplation. This is why we pray the creed together every Sunday; to remind us of what is real and what is of first importance in our human existence. You may be rich or poor, healthy or sick, happy or sad, but all of this is temporary and can either be a means or an obstacle to the life that God has planned for us. No matter how bad we have it on our worst day, there will always be someone who has had it worse and never-the-less will be filled with joy because of their faith. A few years ago I read a book by a Vietnamese archbishop entitled, TESTIMONY OF HOPE. He spent thirteen years in Communists prisons and in the beginning he was very bitter because of the injustice he experienced. After awhile he realized that his bitterness was only making him more miserable. He decided to let go of his bitterness and make the most of the situation he was in. He began to collect pieces of paper and write down all the Scriptures and prayers he could remember. They became a treasure to him. He would also collect bread crumbs and juice from grapes and at night would secretly say Mass with other prisoners. Even those who were not Christian would be present because they could see the hope that these gatherings brought to those who believed. The choice that the archbishop made was in a way like a resurrection story. He was dead in his bitterness, but his act of faith brought new life not only to him, but also to those around him. In his distress he went to Jesus, and Jesus helped him to focus on the present moment and the treasure he possessed in his faith; and he lightened his burden. In a few moments we will renew our baptismal vows together. 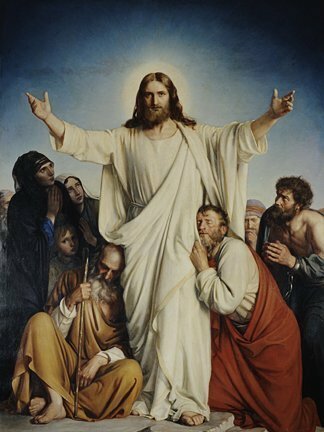 We are reminded that through our baptism we received the theological gifts of faith, hope and charity and the Fullness of the Holy Spirit, which is the indwelling of the Holy Spirit and the possession of the gifts of the Holy Spirit- wisdom, understanding, knowledge, counsel, fortitude, piety and fear of the Lord. It is God’s plan for us that we discover and use these gifts for our own spiritual maturity and the good of His Body, the Church. We have within us the God given ability to choose that which is above and to reject sin; to live with hope and peace even in the most difficult situations, but it is a choice we each must make for our selves- to live by faith. No one can make this choice for us. In a few moments, Jesus Christ who rose from the dead 2000 years ago will be present on this altar. Jesus loves us so much that he gives us himself, body, blood, soul and divinity under the appearance of bread and wine, through the prayers and actions of ordained Catholic priests in thousands of churches throughout the world every day. Even if we would hear the voice of Jesus or see him in a vision, it isn’t possible to be more intimate with him than when we receive him in Holy Communion. However, not everyone who receives Holy Communion receives the same benefit. As it states in the Vatican II documents, “Like the passion of Christ itself, this sacrifice (the sacrifice of the Mass), though offered for all, ‘has no effect except in those united to the passion of Christ by faith and charity…to these it brings a greater or less benefit in proportion to their devotion.’” In other words, even though we are truly receiving the body and blood of Jesus his presence only has effect in us according to our preparation and disposition. As a matter of fact, if we receive the Lord with serious sin on our soul we commit an even greater sin. This is why it is so important that we go to confession frequently; to receive the full benefit of the graces he is offering us. There is no good reason why we should not be prepared and properly disposed for this holy encounter with Christ. God has a great plan for humanity, but we can only reach our potential for happiness by being in a faithful relationship with Him. Our purpose for being on this earth is to know, love and serve God so we can be happy in this life and for all eternity. We come to know God by believing in the truths He has revealed to us through the Scriptures and the Church and by then being faithful to what we believe. In our Church He has given us every thing we need to live a life close to Him, but we have to make the choice. What we celebrate on Easter is the resurrection of Jesus Christ. It is the recalling of a moment in history that changed the human experience for ever. This moment was in the mind of God from all time; prophesied by the prophets, and witnessed to by the apostles who encountered Christ on several occasions after he had risen from the dead. Because of the passion, death and resurrection of Jesus Christ we now have hope in eternal life and we need not be weighed down by the difficulties of this present life as if this is all there is. May our Risen Lord bless you with His abundant joy and may you be renewed in your love for Him and His Church! Rejoice in hope! He is Risen!